I’ve mentioned that one of my favorite parts about blogging has been the incredible community that comes with it. Through interesting groups, eye-opening forums, and commenting on posts I’ve met some amazing people who are equally as passionate about food. Together we share knowledge, tips, and, of course, recipes. I feel connected to these individuals, even if we’ve never met and live an ocean apart. Which is why I was so saddened to hear about the passing of Daniel Saraga, the man behind The Haggis and the Herring. I first “met” him through a food blogger yahoo group that we both belong(ed) to, and he was always a vocal member, piping up with opinions and helpful advice at every exchange. We are also both part of the Secret Recipe Club, and today we as a group have come together for a special edition of SRC in tribute to Daniel. For the first time at SRC, we are all choosing a recipe from the same blog, The Haggis and the Herring. Daniel’s blog dates back to 2009 and there are hundreds of delicious recipes to choose from, with something for everyone. I immediately knew that I would make this chicken on rice with creamy dill sauce, since I’ve had it bookmarked from the minute I laid eyes on it last July. I’m sad that it’s taken me this long to do it. Daniel was inspired by an article on street meat in Manhattan. “The dish sounded good, but the recipe was off,” he wrote. “A little vague, mostly in the method, how to cook the chicken, etc — and I could tell right away: this isn’t how it’s prepared at a vendor’s cart.” So he took it from there and created his own version. As for me, a native New Yorker, bells started ringing immediately when I saw the post. This chicken with rice and creamy dill sauce is available at every halal food cart in the city, of which there are many. For $5 you can get a big Styrofoam container of this filled to the brim and complemented with a small salad. It’s the ultimate budget lunch, and one of my guilty pleasures. Living in Israel, I miss it. I was excited to make it and thrilled with how it came out. Of course, the world works in funny ways and I ended up marinated the chicken for well over 2 days (instead of the prescribed overnight) since my best friend went into labor the night I was going to make it. But it just meant the flavors were only more intense, which was not a bad thing. The chicken is tender and tasty and the sauce is, as promised, magic. Daniel, we’ll miss you and your creative recipes. We’ll miss your wit and honesty, your advice and observations. My heart goes out to Daniel’s wife Meredith, his children, and the rest of his family. His brother Abisaac is planning on continuing The Haggis and the Herring in Daniel’s memory. To learn more about Daniel, read his wife’s beautiful tribute here and his brother’s post here. Inspired by the food carts of New York City, this flavorful and tender chicken on rice with creamy dill sauce is sure to be a hit with everyone in the family. Combine the turmeric, cumin, coriander, cloves, paprika, curry powder, salt, pepper, garlic, lemon juice and 1 tablespoon of the oil in a medium bowl and whisk in yogurt. Transfer mixture to a large zipper bag, add onions and chicken and seal bag (or toss in large bowl and cover tightly with plastic wrap). Shake bag to coat chicken and let marinade overnight. To cook chicken, heat remaining 2 tablespoons olive oil on high in a large pan. Add chicken and onion mixture and cook for 15-25 minutes, stirring occasionally until the chicken is cooked through and most of the liquid is gone. 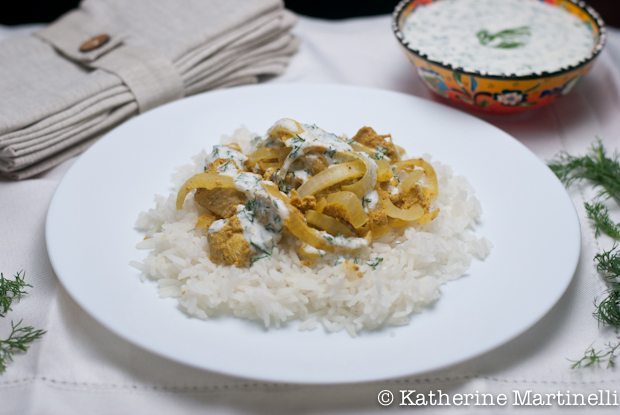 Serve with rice and creamy dill sauce. Combine all ingredients in a food processor and mix thoroughly. This is a beautiful tribute, Katherine. I’m so sorry to read of this tragic loss. You’re right, connecting with others is such a rewarding part of being in the blogging community. Thank you for sharing about Daniel. Thank you for giving us the background on how Daniel was inspired to make this recipe. It sounds very tasty, as well as a fitting tribute. Nice to be in SRC with you. You were very lucky to have had Daniel in your life for longer than many of us. This is a beautiful and fitting tribute to him. I am honored to be a part of this community. 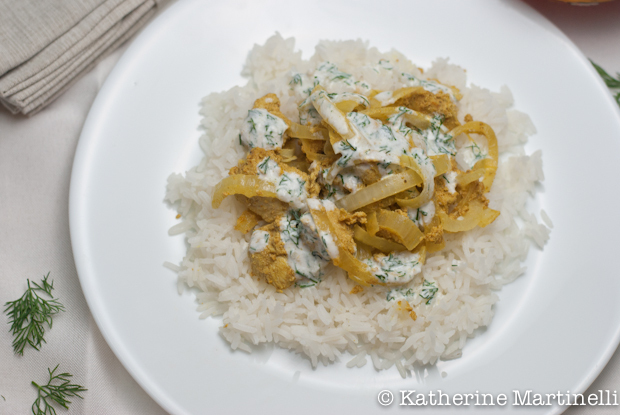 What a wonderful tribute to Daniel, and a perfect recipe pick – any dish that combines chicken and rice is (to me, anyway) the perfect comfort food, and exactly the kind of thing I turn to whenever I feel blue and need a pick-me-up. I’ve got this recipe bookmarked for just that kind of occasion, and am very much looking forward to it now that I know it’s so close to the food cart version. Such a nice tribute. And a great rendering of his recipe – truly appropriate. A great way for the Secret Recipe Club to remember Daniel. Beautiful tribute and fitting recipe for you and Daniel. SRC is an amazing community. Awesome post and what a great community we have! Love your tribute and the recipe you choice! So much so this is getting pinned and I will be making this for my hubs very, very soon. Beautiful tribute! The dish looks delicious. You have a beautiful blog! I’m so sorry we’ve lost such a supportive blogger friend. What a lovely tribute, Katherine. Thats sad… I never knew him and now its too late. It will be odd to read the food articles he had posted before, knowing that he is dead now. Katherine that’s a beautiful touching tribute! The flavors in this dish are perfect for our needs. I cook pretty much the same and I wished we had this type of street food here. Love that you guys are making Daniel’s recipes in tribute … Great Job! What a tragedy! I am in tears after reading his family’s tributes. What a special man he was and I regret that I didn’t have the chance to know him. What a special Secret Recipe Club blog hop this is. Thank you for sharing the recipe, and your heart, Katherine. What a great tribute to Daniel and what a great group of bloggers! I’m sure Daniel would have loved and appreciated the many, many tributes and kind words about him. The community that comes with all this is very special indeed…I wonder if there are things similar in other industries…I would guess probably not. And what better tribute to pay than to share his recipes. I just read Dan’s wife’s eulogy on his blog and became so sad. 🙁 You had a very nice trubute to him and it’s beautiful to see so many people made his dishes. Your chicken on rice sounds really delicous. Thank you for introducing another great blogger and I wish I have known him before.